At the southern end of Kintyre, close to the village of Southend are a series of unusual visitor attractions closely grouped together. 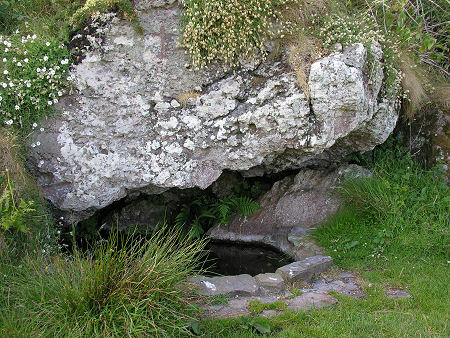 Just to the west of St Columba's Chapel is a rocky outcrop on which you find St Columba's Footprints, while nearby is St Columba's Well. 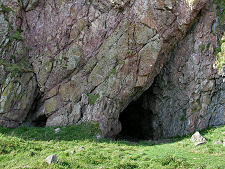 Two hundred yards to the west are the Keil Caves. A parking area has been provided on the landward side of the road a short distance to the west of Keil Point. From here you walk back to a gate in a wall, where signs point you in one direction to the caves you will already have seen from the road, and in the other up a well-laid set of stone steps onto the outcrop carrying the footprints. 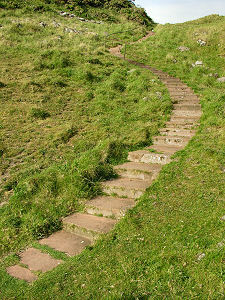 If you climb the steps you find that the top of the outcrop bears two footprints. The more southerly is laid parallel to the shore, while the other is at 90 degrees to it. Each print is a little less than a third of a metre in length, and between them is carved the number "564". Footprints caved into stones are found in a number of places in Ireland and Scotland, and are usually associated with king-making ceremonies. As there was a major fortress of the Kingdom of Dalriada at nearby Dunaverty from the 500s it is quite possible that at least one of the footprints might well be associated with it, like the carved footprint at the other Dalriadan centre at Dunadd in northern Argyll. 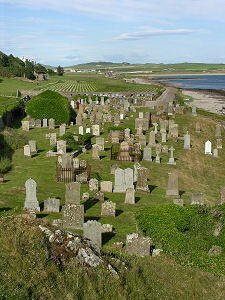 The story is blurred, however, because St Columba and 12 followers briefly landed in this part of Kintyre in early 563 at the start of his exile from Ireland. The "best guess" about the real story of the footprints is that a single footprint dating back to the Dalriadan era became associated over the centuries with St Columba, and is why St Columba's Chapel was established immediately to the east. 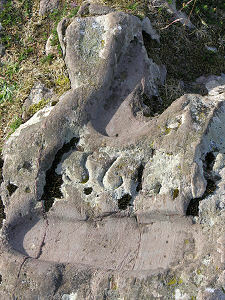 Then, according to a story told many years later by his grandson, in 1856 a local mason called Daniel McIlreavie helped the legend along a little by carving a second footprint into the rock and adding the (wrong) date for Columba's landing of 564. 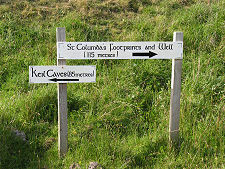 50 yards or so beyond the footprints, beside a grassy path that descends past the rear of Keil Churchyard and St Columba's Chapel, is St Columba's Well. Here a rocky bowl has been carved into the slope, where water collects from a spring. The assumption is that this is also associated with St Columba's visit to Kintyre, but it seems odd that it lies outside the wall enclosing the churchyard immediately to the south and you can't help wondering, again, if the well may be another attempt to enhance the Columban links in the 1800s when tourists would first have been reaching the area in reasonable numbers. If aspects of the footprints and well may not be all they seem, the Keil Caves are far more elemental and matter of fact in their nature. Excavations suggest that they have seen human occupation at many different periods, ranging from the prehistoric residents neat enough to bury the shells from the shellfish they ate in a pit, right into the age of Dalriada. And more recently, too. The 1881 Census reports that Keil Cave was home to John McFee, a 22 year old tinsmith, his 21 year old wife Margaret, and their young son Andrew, together with John's cousin Alex McCallum, a 45 year old basket-maker, his wife Mary and their daughter Bella. 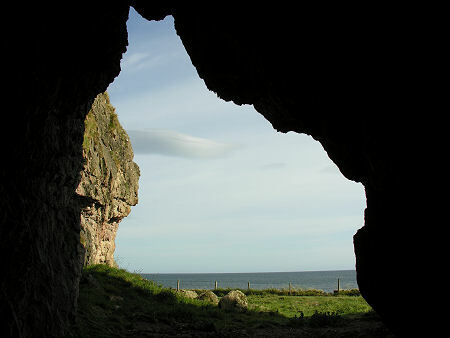 There are a number of caves at Keil, with names like the Great Cave, the Piper's Cave, and the Hermit's Retreat. Two of these names are self-explanatory. 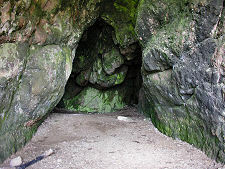 The Piper's Cave was named after the legend of a piper who disappeared while passing here on his way home late one night and whose ghost can apparently still sometimes be heard playing the pipes.